Here we go….the first “real” post on the rebooted A Cup of Tay. I feel like there’s a lot of pressure to perform, so be gentle on me, guys. For those of you that are my IRL friends or follow me on the Facebooks or the Instagrams, you know that I’ve lived with my husband in Laramie, Wyoming, for the last two years, and moved to Denver about three months ago. While I’ve lived in a big city before (college in Philly) and have spent a lot of time in Denver, living in the middle of a city NOT as a college student is very different than living in a small college town in Wyoming. Or at least that’s my experience so far. In Wyoming, people will literally stop traffic to let you in if you’re merging onto the interstate. In Denver, if you cut someone off in traffic in a PARKING LOT, they will loudly yell the F-word at you before throwing their lit cigarette out the car window at you. Or flip you off. Denver people love doing that almost as much as they love rooting for the Broncos. In Wyoming, if you’re trying to parallel park, there’s a good chance someone nearby will spot you and help you park. In Denver, if you park poorly in your apartment complex in your very large truck that is very hard to park, someone will leave a friendly note on your car that says “You need parking lessons. It’s BAD.” I didn’t know parking lessons existed. Apparently they do. In Wyoming (and especially in Laramie), if you need anything that you can’t find at the local Wal-Mart (or if you’re lucky, Kmart), you’re out of luck. In Denver, you can’t swing your arms around without hitting literally any store you can think of en masse. Seriously. I needed to buy a desk for our apartment and I typed “Target” into Google Maps and five came up, all 10 minutes away from where I live. It’s almost choice overload, I tell ya. In Denver, you have to listen to the radio to get the traffic report (like you would the weather report) to know how long it will take you to get across the street. In Wyoming, a traffic jam only happens when a herd of wild turkeys decide to cross the road or when a semi truck blows over because of Wyoming’s gale-force winds (yes, this happens!). 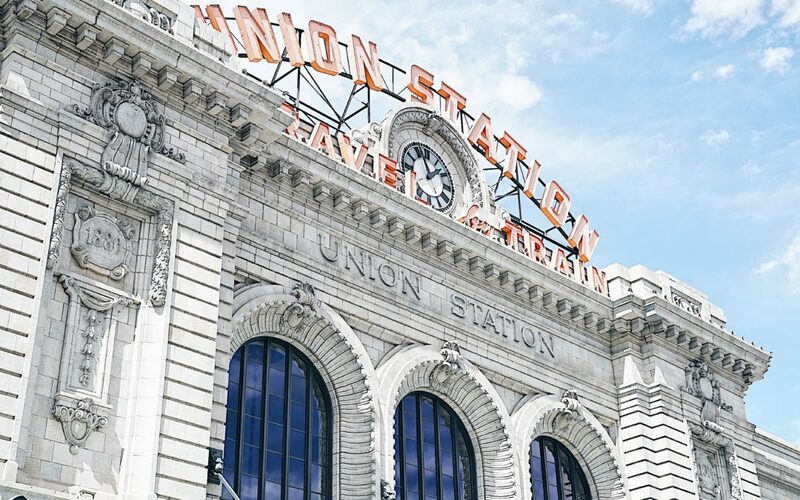 In Denver, you can find about any type of cuisine you want, including cuisine for any diet you might be following. I had a paleo muffin the other day while out and about. It tasted like blueberry chalk but it was the novelty of the thing, ya know? In Wyoming, they sell shirts that says “vegetarian is an old Indian word meaning ‘bad hunter. '” That says about all you need to know about Wyoming’s understanding of alternative diets. In Denver, they have a chain of gas stations called “Stinker.” I kid you not, the mascot is a skunk. In Wyoming, they have a classily-named chain called Kum & Go. I need not explain further. And I cannot decide which is weirder/worse. So far, I’m loving Denver and Brandon is learning to love it…he’ll get used to all the people. I hope. Have you ever moved to a new city? How was it different than your old city? Share your sassy observations with me. Oh and if you’re from Denver/Wyoming, has anyone ever thrown a lit cigarette at you? Wondering if I’m just REALLY bad at driving in parking lots. For those of you that have known me for awhile, you’ll remember the days of old when the original A Cup of Tay was a thing. I dished out sassy posts weekly, and then less often. I shut down A Cup of Tay temporarily, then brought it back…and eventually, I shut A Cup of Tay down for good. There was crying. There was complaining. There was rioting in the streets (okay, maybe not). The point is, people weren’t happy about it. And to be honest, I wasn’t either. I shut down A Cup of Tay because I felt like I’d reached a writing rut. Blogging no longer felt natural or exciting, and I was struggling to put together my trademark humorous content for readers. So I called it quits. Thinking maybe I just needed to shift focus, I started an alternative blog last year, Grace and Grace Alone, where I planned to blog about my faith. The problem was, I wasn’t feeling any more inspired to write about my faith than I was about anything else, and blogging about just faith-related topics felt too restrictive. Usually I laugh and tell her it’s a thing of the past, but this time it got me thinking. Yes, it’s a little weird to revive a blog like 3 times. But it’s also silly not to give the people what they want (ha) and to pick something back up that I enjoy. I feel like a lot has changed since last time A Cup of Tay made its appearance, so I’m going to start with a clean slate, not uploading any of my old posts. Maybe I’ll slip one or two in every once in awhile (Brandon wrote like a four-part story of our relationship, for example, and it’s freaking adorable). I’m going to blog about what I love blogging about, which is whatever the heck I want. But really though, you’ll probably find posts on married life, my faith, Thor the Dog (he may write some posts of his own! ), my weight loss journey, and anything else I feel like I can make humorous enough to share. For those of you who have become friends with me since I closed down A Cup of Tay, thanks for reading. And for those of you who have, in your own way, cried, complained, or yelled through a phone at me to keep writing, thank you.